analysing datasets we have commissioned on for example biodiversity. We have already developed strong arguments against the Eastern options that will be presented at the public meeting on 12th September. ● Thursday 21 September, 4pm to 7pm, Warmley Community Centre, 20 Deanery Road, Warmley, BS15 9JB. Thanks to a hardy bunch of volunteers residents should all now have received, or will receive the newsletter PPC has published - that's 1300 copies printed and delivered by hand. Volunteers: a database of information has been collated and each Councillor has been allocated responsibility for particular groups that have been categorised by area, tasks and expertise. Banners: SGC asked for these to be removed as they were deemed to be in breach of highway advertising rules when attached to verges, railings etc. PPC has other posters to hang in indoor public spaces where people congregate - watch out for these! Drone flight: Residents and PPC Councillors are producing a short film that shows the Eastern Options from the air and will highlight what would be lost along the way if constructed. Siston Meeting: Our Chair and Vice Chair attended the public meeting held at Siston yesterday evening - Siston residents were disgruntled by a perceived lack of action and urgency on behalf of their Councillors. The meeting was covered by the press - you can read reports here and here. PPC had a great turn out last Tuesday with 63 volunteers signing up to help and a wide variety of skills and expertise offered to the campaign. If you want to sign up and haven't had a chance yet please download a copy of this form and return to parish.council@pucklechurch.org. Siston residents have called an extraordinary parish meeting to inform and encourage participation in the consultation. The meeting will take place on 10th August at 7pm St. Anne's Church, Siston. All welcome. On Tuesday 1st of August the Parish Council will be holding a "call for volunteers" session at the Community Centre between 18:00 and 19:30. A working party of Pucklechurch Parish Councillors met with representatives of SGC on 19th July in order to get a clearer understanding of the consultation process, timescales etc. This document summarises the discussion and action points that were agreed. South Gloucestershire Council has confirmed that the public consultation will start on 21st August and last for 8 weeks. Information and a questionnaire will be available on SGC's website and there will be public exhibitions at local venues. Details will be advertised on this webpage and elsewhere. Pucklechurch Parish Council has agreed a raft of measures to ensure that all residents within the parish are provided with information and an opportunity to make their opinion known. This includes making sure that appropriate guidance and response forms are available in paper format as required and that residents will have access to accurate and up to date plans and associated documentation. PPC understands that residents have become aware of a number of speculative development proposals that have arisen from several calls for sites as part of the local plan-making process. The Joint Spatial Plan is still being formulated and more consultation is due over the summer. Pucklechurch has not been identified for strategic housing growth as it was not considered compatible with the spatial strategy. NONE of these sites has been approved: they have been offered by private developers whose concept documents will always present a convincing case in their own favour whilst playing down the constraints. There is also much speculation about how building a road through the parish may lead to future housing development as but there is no evidence to support this as a driver for building the road. Key message: Our parish is facing one of the biggest challenges to its continued existence: if enacted, the option to create a new motorway junction and associated link road will have potentially devastating and irreversible consequences for both the local landscape and our community. Key message: Pucklechurch Parish Council will do all that it can to ensure that its parishioners are informed, engaged and enabled to make their voices heard and to feel that their contribution to the consultation process has the capacity to make a real difference: no stone will be left unturned. 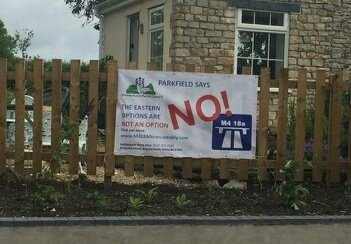 Key message: Pucklechurch Parish Council is unanimous in its opposition to the Eastern Options for junction 18a and its associated link road – the Eastern Options simply do not deliver the outcomes for which the cross-party campaign secured the finance for a feasibility study. Key message: This is a whole parish issue – there are consequences for all areas of settlement. As Councillors, we act on behalf of the whole community and whilst acknowledging there are specific issues that will resonate with the residents of particular areas we make no distinction in fighting harder for one over another. Key message: These options are not a planning application: they have been produced as part of the feasibility study funded by central government which is being delivered by an independent consultancy (CH2M) steered jointly by SGC and Highways England. If the scheme progresses, it would still require detailed design, evaluation, preparation of business cases and statutory permissions. It would be considered a national infrastructure project and take many years to come to fruition if approved. Key message: The Eastern Options would have detrimental consequences for the surrounding parishes – this is more than a Pucklechurch Parish issue. It’s not NIMBYism to want to avoid the creation of new rat runs and traffic congestion over a much wider region. Key message: This proposal would have irreversible consequences for the Bristol/Bath Green Belt but it also has potential consequences for our community identity, multiple designated heritage assets, our industrial and archaeological heritage, the conservation area, the character of the local landscape (including the setting of the Cotswolds AONB) and its biodiversity, as well as residential amenity, traffic and air quality. Key message: This is not a done deal. Residents should participate in the consultation to make their views known. As many of you will no doubt have seen in the news well over 100 residents supported the protest meeting - thank you to everyone that came. The crowd was addressed by both MPs who pledged to oppose the option that would cut through our parish. 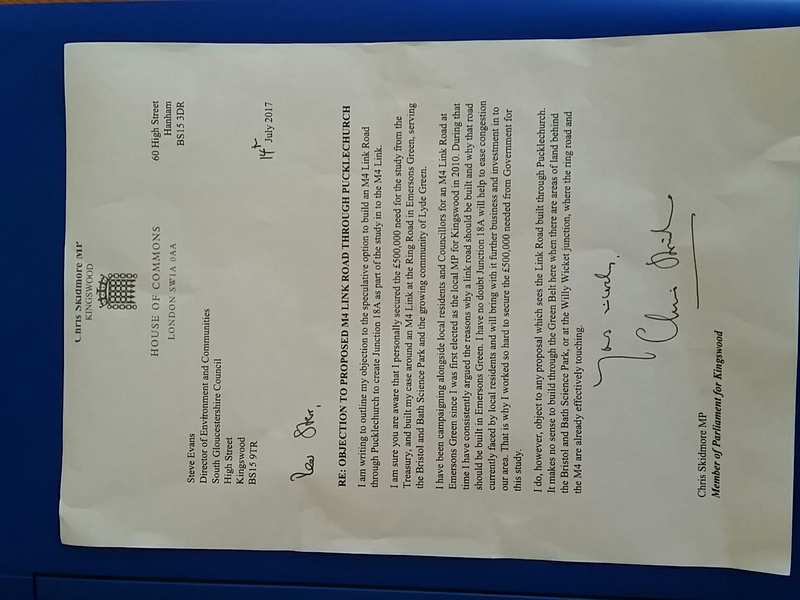 Chris Skidmore went so far as to say that he would remove support for Junction 18a if the Pucklechurch option remained on the table. A copy of Mr Skidmore's letter of objection to Steve Evans, Director of Environment and Communities, at SGC can be seen here. SGC issued a statement via its website that incorporated a new version of the plan - download a copy here. Read a copy of the SGC statement here. There will be a public protest meeting with Chris Skidmore MP and Luke Hall MP in attendance against the Eastern option for the M4 J18a. It is important that all available parishioners attend. I expect press and television so we must make our objections visibly clear! Two options are being tabled for the creation of a new motorway junction on the M4 (18a). Pucklechurch Parish Council was only made aware that one of these options would directly impact the parish approximately 3 weeks ago at a stakeholder briefing. This was the first time an option to construct a brand new link road through the parish to link up with a new motorway junction at the Westerleigh Road was tabled. Following the attendance of BS at the recently held above briefing, members were provided with an update. BS explained (with the use of maps) the 2 preferred options for the siting of the junction were identified as Lyde Green and Pucklechurch. BS told members that the public consultation was scheduled for August/September and that he felt the proposals and details of the consultation should be shared with residents to which all members agreed. As the consultation details provided at the briefing were not specific members agreed that more information was required prior to communicating with residents. ACTION. Clerk to invite a Senior Officer from the project to attend the next council meeting in order for members to be fully appraised on the options identified and for specific details about the public consultation in terms of when, format and form to be delivered to be obtained prior to organising and promoting a public. Information about the proposals were shared with the Neighbourhood Plan group on 3rd July and the response PPC received with regard to its request for SGC officer attendance included as an agenda item for discussion at its full council meeting this evening. As many of you will already know a large number of residents attended this meeting and a question and answer session took place followed by the formal meeting. Draft minutes of the meeting are on our website here - residents should be aware that PPC unanimously resolved to oppose the option for the construction of a new link road through the parish and for junction 18A to be sited at Westerleigh Rd. PPC has formulated a draft communication strategy to both inform and to enable residents to engage with the consultation process and will be pursuing a meeting with SGC in order to ensure that the timetable and mechanisms by which this takes place is appropriate, adequate and inclusive. More information on the proposals and the consultation will be published here as as soon as possible. In the first instance residents are encouraged to share the information about the proposals with their friends and neighbours. NB A public meeting has already been scheduled at Pucklechurch Community Centre for the evening of 12th September 2017 - PPC will be inviting both Luke Hall MP and Chris Skidmore MP to attend.